One of 43 maps showing changing ice-margin positions in Wisconsin between 31,500 and 11,000 years ago. Download publication. For the past 2.5 million years the climate of the Northern Hemisphere has fluctuated between conditions of warm and cold. These cycles are the result of changes in the shape of the Earth’s orbit and the tilt of the Earth’s axis. The colder periods allowed the expansion of glaciers that covered large parts of the Northern Hemisphere. Changes in climate have followed a regular pattern for the past 700,000 years. Each cycle lasted about 100,000 years and consisted of a long period of generally cooling climate during which glaciers grew, followed by shorter periods of conditions similar to or warmer than those of today. The last cycle of climate cooling and glacier expansion in North America is known as the Wisconsin Glaciation. About 100,000 years ago, the climate cooled again and a glacier, the Laurentide Ice Sheet, spread across the continent. Near the end of the cycle, beginning about 31,500 years ago, the glacier began its advance into Wisconsin. It expanded for 13,500 years before temperatures warmed again and it began to melt back. It took another 7,000 years before the ice finally retreated from northern Wisconsin. We’ve mapped the movement of the ice, in roughly 500-year increments, from its initial arrival in Wisconsin to its final departure. 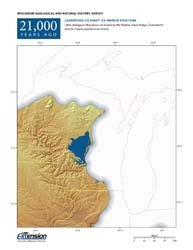 The maps are available for free download in the publication, Laurentide Ice Sheet: Ice-Margin Positions in Wisconsin (ES056), and as a video (below). Movement of the Laurentide Ice Sheet was shaped—to a certain extent—by the landscape. Highlands diverted the glacier into lobes (tongues or fingers of ice) that advanced into the lowland areas. The Lake Michigan Lobe of the glacier flowed down the Lake Michigan lowland to central Indiana and Illinois. The Langlade, Wisconsin Valley, Chippewa, and Superior Lobes covered northern Wisconsin. The Green Bay Lobe flowed south in the Green Bay lowland, advancing over the east end of the Baraboo Hills and into both ends of Devils Lake gorge. The edge of the Green Bay Lobe was probably a steep ice slope, perhaps several hundred feet high, littered with rock debris. Behind the steep slope, the ice surface probably rose very gently toward the center of the ice sheet, where the ice was thousands of feet thick. Beyond the edge of the Green Bay Lobe lay a nearly treeless tundra, whose surface thawed for only a short time during the summer; beneath this soggy surface, the ground was deeply frozen. These tundra conditions persisted from about 26,000 to about 13,000 years ago. The polygonal patterns produced by the cracking of the deeply frozen ground can be seen on aerial photographs of parts of Wisconsin; these tundra polygons look much like those forming in the Arctic today. 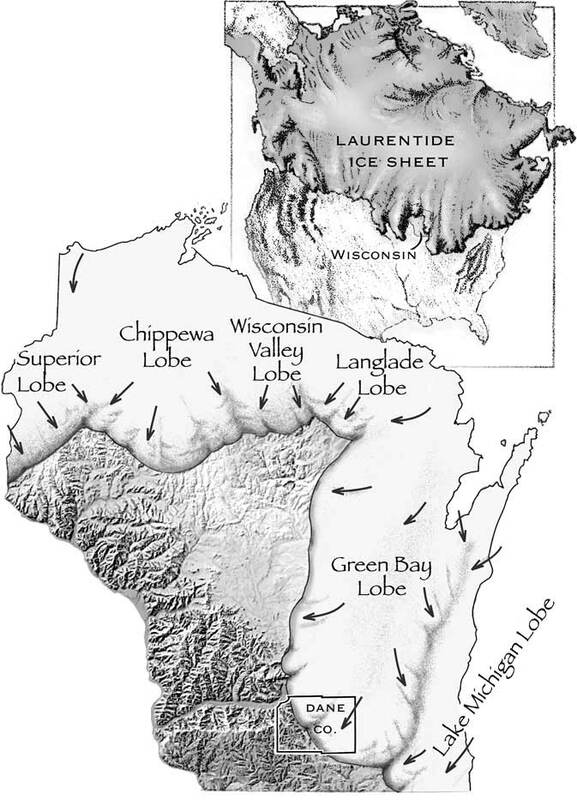 The Laurentide Ice Sheet and the large volume of meltwater flowing from it greatly altered the landscape of Wisconsin. As a result, the landscape of the area glaciated during the last part of the Wisconsin Glaciation is notably different than that of areas glaciated earlier in the Ice Age (where erosion has destroyed most earlier glacial landforms) and areas that were never glaciated. For example, the outermost limit of the last glacier is marked by a conspicuous ridge of glacially deposited debris. The many lakes and wetlands and the irregular landscape that characterize so many areas of eastern and northern Wisconsin are also a direct result of the last glacier. 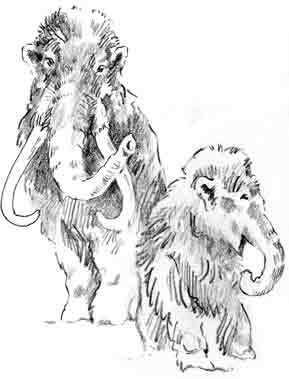 The tundra that accompanied the last glacier in Wisconsin was the home of the woolly mammoth, which fed primarily on grass. As climate warmed near the end of the last glaciation, tundra gave way to spruce forest; this was the home of the American mastodon, which fed on twigs, cones, and grass. 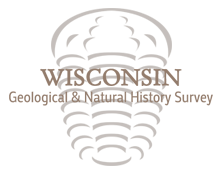 The following publications describe the shaping of Wisconsin's landscapes in greater detail.